Reviewed by John S. Manor! John S. Manor is a freelance writer who has had an Atari computer since 1981. His collection of computers now includes an 800, 800XL, 130XE and 520ST. His other interests include astronomy and reading science fiction. Wizball is an arcade computer gamer's delight. It has stunningly sharp, lively animated and colorful graphics; the action is fast and furious but also requires strategy; and one to four players can join in the fun, separately or as teams of one or two. Now you might say: "Great! But I don't have $35 (or more) to plunk down for this great game." No problem. Wizball's suggested retail price (before mail-order companies cut it down) is only $14.99! Yes, go ahead, reread that last part. For a very down-to-earth price you get a fantastic game that will put to shame other games, costing three or four times as much, that give far less in entertainment value. In Wizball, you play the part of Wiz. The Evil Zark and his minions have taken all the color out of Wiz-world, and you and your companion, Catelite, must restore them as the Evil Zark tries to stop you. You travel across the bleak, gray landscape in a bouncing Wizball. Cat appears later in the game, following loyally behind you in a small saucer-shaped ball. The Wizball is controlled by the joystick. Cat can be controlled by holding the button and moving the joystick, or it can be controlled by another player. You have to maneuver over obstacles and avoid running into Zark's aliens. Bouncing into aliens costs you one of three lives (you get four lives in the ST version). You control the amount of spin on the Wizball (tennis players will appreciate this)— the more spin you have, the faster you move. You can blast aliens that dare to get in your way. When you shoot the aliens that look like rotating molecules, they turn into green pearls. This is important. At the top of the screen are seven icons, representing different powers. Some icons have two powers. The powers are: Thrust, Anti-Grav (no more wild bouncing), Beam, Double beam (shoot two directions), Catelite, Blazers, Wizz Spray, Cat Spray (shoots all around), Smart Bomb (one) and Shields (temporary). Running into a green pearl makes the first icon flash. If you want that power, then you just wiggle the joystick left to right. If you want another power you have to keep running into green pearls until its icon flashes. Controlling a bouncing Wizball is difficult. But if you select the first power icon twice, it will stop bouncing and roll steadily anywhere on the screen. Precise control over the Wizball is vital to defeating the aliens. The manual says there are seven levels in Wizball. In the Atari ST version I have found eight levels, but at the start you can visit only the first three levels. You travel between levels by bouncing into narrow vertical tunnels. Some tunnels have signs that tell you which direction they go. Some don't. On each level you will find aliens and color bubbles. When you kill the aliens, the bubbles will come bouncing at you. The bubbles contain the trapped colors of Wizworld. Shoot them and drops of color fall. You must send Cat to catch them. As it does, three color cauldrons at the bottom of the screen will fill up. There is only one color on each level. A fourth cauldron at the far right will show you what target color you must go for. 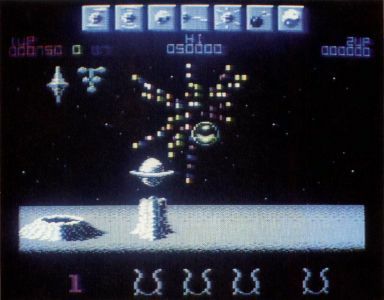 In the Atari ST version, some drops have different colors with magical powers. A white drop gives Wiz another life, while black will black out the screen. Fill in the colors of the landscape three times to move on to the next level. When you fill a cauldron with color you are transported to a Bonus Stage. There you kill aliens for bonus points. Kill a Wiz look-alike, and you get another life. Then you go to the Wizlab where a beautifully animated sequence shows Wiz restoring some of the color to Wizworld. In the lab you can choose one control or weapon that all your Wizballs will be able to use for the rest of the game. Wizball comes on a single-sided disk with a brief but informative manual. The manual covers several systems besides the ST, and it was a little hard at first to make sense of the display because it varies for each type of computer. There is a separate screen for high scores, but once you're done playing and turn the computer off, your scores are gone. Scores are not saved to disk. This is a feature that I miss in this game, since I like to be able to show off my high scores. In Wizball the Evil Zark and his minions have taken all the color out of Wizworld. You, the Wiz, and your companion, Catelite, must restore them. I had a great time playing Wizball. At such a bargain price you really can't miss. Wizball would be an ideal birthday or holiday gift for any computer enthusiast. I recommend it with the highest honors.